The Little House of Concrete Bookshelves: David Hunt "Girt: The Unauthorised History of Australia"
David Hunt "Girt: The Unauthorised History of Australia"
Spend any time at all contemplating the notion that there’s a “Real Australia” lurking out there somewhere or pondering the possibility of an Australian identity, and you’ll more than likely come to recognise that we’re rather good at denialism. Now, The Argumentative Reader might contend denialism is a little bit strong, and in the face of that sort of criticism you might be tempted to water things down a little. Substitute a firm but polite we’d rather not talk about that, thank you very much, perhaps. That’s one of the things I tend to find interesting when the subject of the History curriculum rears its head from time to time. There seems to be an unwillingness to consider certain topics, and if anyone’s scratching their heads and wondering why students find Australian history boring, you might start by considering the possibility that we’ve chopped out most of the interesting bits because there’s stuff in there that we’d rather not talk about. My primary school exposure to Australian history came, of course, in an entirely different era, and one in which the possibility of someone producing something like the title under discussion here wasn’t totally non-existent. Just mostly, like about 99.999999%. 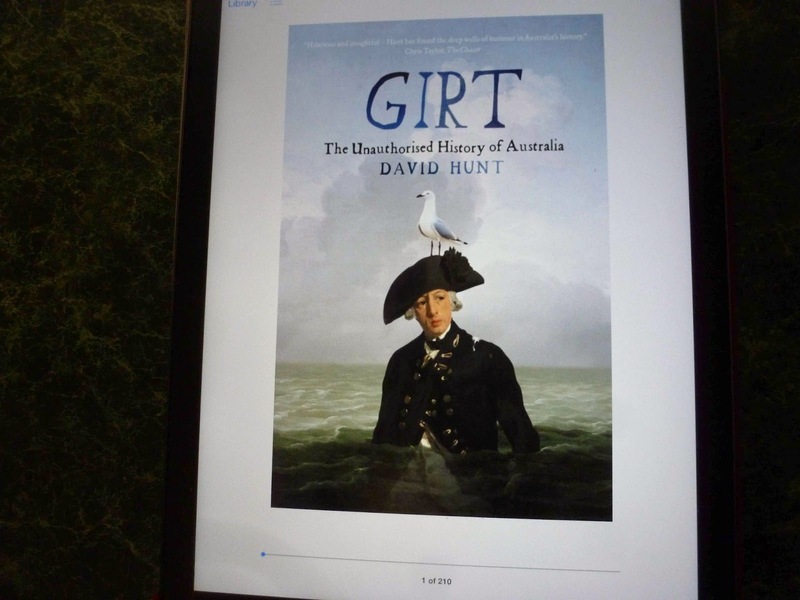 Author David Hunt is, among other things a comedy writer, and takes great delight in lampooning Australia’s earliest years, taking the narrative as far as the end of the Macquarie era. That leaves a fair bit of territory to explore, and hopes he has the inclination to continue. He covers all of what one might term the usual suspects, from the Indigenous destruction of the continent’s ancient megafauna by fire, through Makassan fisherman trading in Arnhem Land to seventeenth-century Dutch explorers sailing along the Western Australian coastline busily nailing plates to trees. It does not read like history, but like the most beautiful lies … but they are all true, they all happened. And, of course, when he gets to the English contribution to our nation’s history and national identity things get really interesting. We get the connections between Captain Cook of the Endeavour, and Star Trek's Captain Kirk of the star ship Enterprise and learn that the first and last space shuttles, took their names from the two vessels. As far as Cook is concerned, the Captain Cook Monument at Botany Bay has him setting foot a day early (on 28 April 1770 rather than on the afternoon of the 29th). When he set out on his first voyage Cook had never crossed the equator. By way of contrast the ship’s goat had circumnavigated the globe the previous year and received a silver collar engraved with a poem by Dr Samuel Johnson after its second circuit . And then we get to Joseph Banks, a dedicated pants man, who’d planned to smuggle his mistress onto Cook’s second voyage disguised as a Mr Burnett. One could cite further examples of eccentric behaviour from a botanist who was dismissive of Portuguese gardening techniques and displayed an inclination towards fishing trips with two or three Ladies of pleasure accompanied by his mate the Earl of Sandwich, who happened to be First Lord of the Admiralty and would go on to have his name associated with the dietary staple of the Australian school lunch. There are all sorts of other examples that could be cited, and we’re definitely getting close to spoiler territory, but one can’t help pointing out that Mary Reibey, who is portrayed on the $20 note, was a cross-dressing convict entrepreneur who built up an extensive pastoral, hotel, shipping and sealing empire and leased her house to Governor Macquarie so it could be the first branch of the Bank of New South Wales. Macquarie, we learn, is hardly the shimming light he was presented to primary school students of my generation, and William Francis copped a seven year sentence for stealing A Summary Account of the Flourishing State of the Island of Tobago. And, trust me, there’s plenty more detail to revel in. One awaits the sequel with considerable interest.